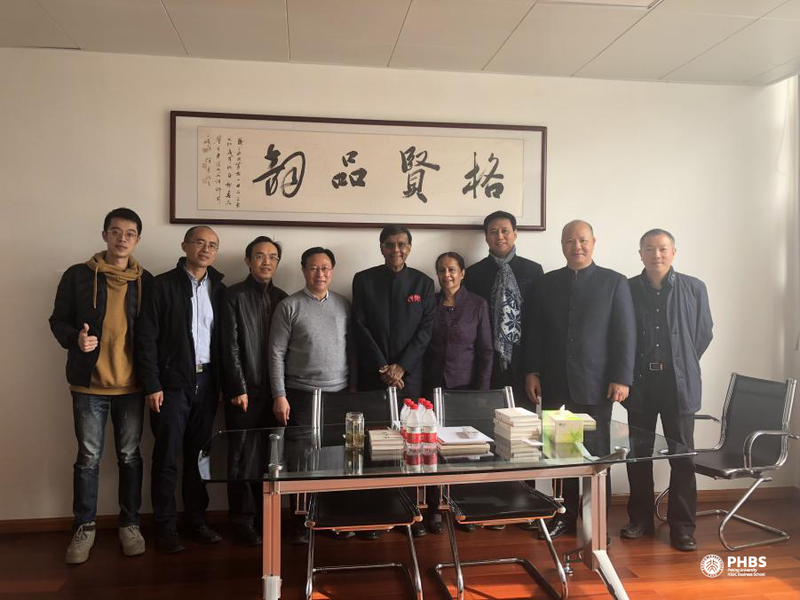 PHBS Center for Green Economy held the workshop of Ecological Civilization and Green Economy with the support of Peking University Shenzhen Graduate School under the guidance of Chancellor Wu Yundong on 13th of December 2018 in the school premises. 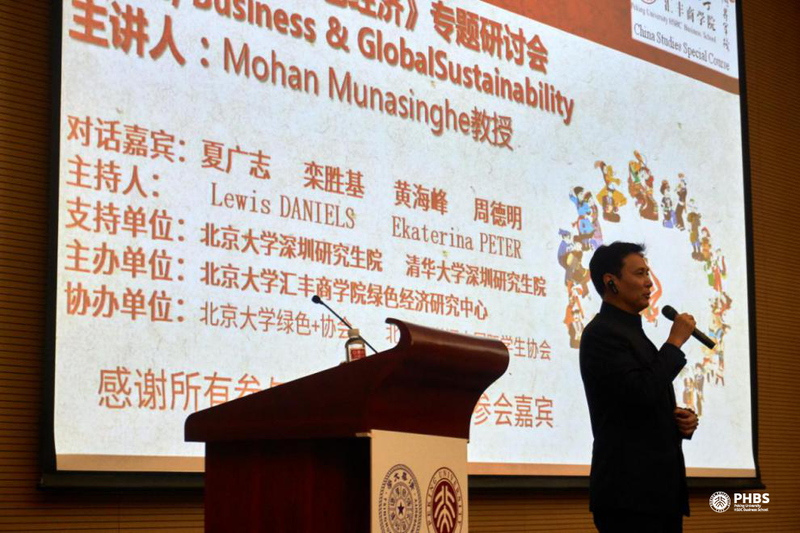 The guest speaker of the workshop was the famous Professor Mohan Munasinghe who gave speech about Ethics, Business and Global Sustainability in the presence of about 150 audience. Prof. Munasinghe is a Sri Lankan economist is the formal vice-chair of the Intergovernmental Panel on Climate Change and also shared the Nobel Peace - Prize in 2007. 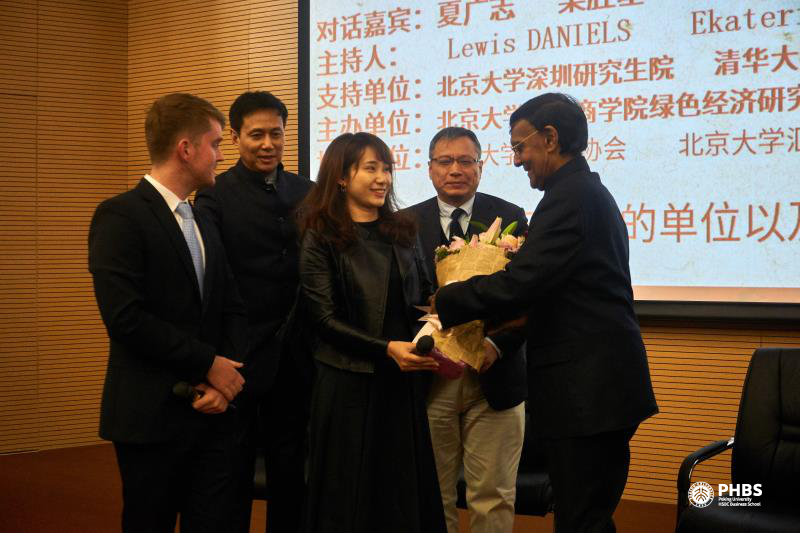 He is the founder of the Munasinghe Institute for Development and has since become a distinguished guest professor at Peking University. He has also co-authored over 90 books and several hundred journal articles surrounding his most notable field of sustainable development. 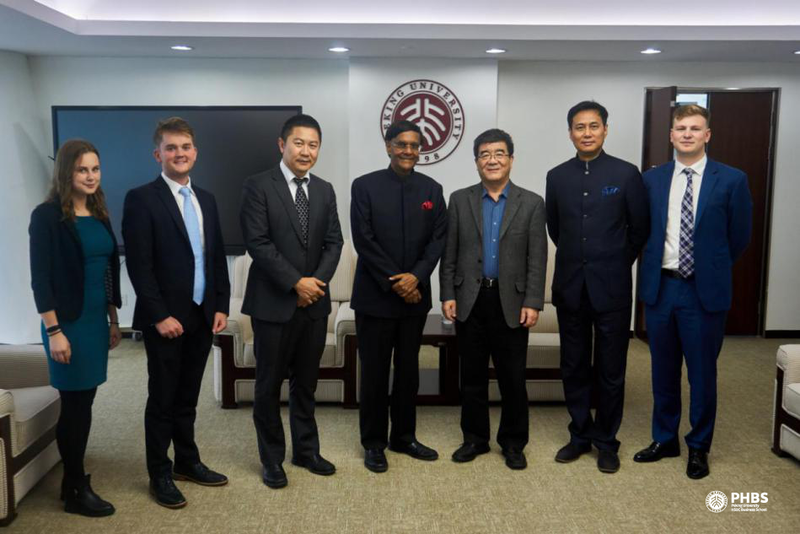 Peking University Shenzhen Graduate School Chancellor Wu Yundong host Prof. Mohan Munasinghe and his wife, Prof. Huapeng Qin, Prof. Qiyong Xu and Dr. Huanan Wu and Peng Cheng attend the meeting. 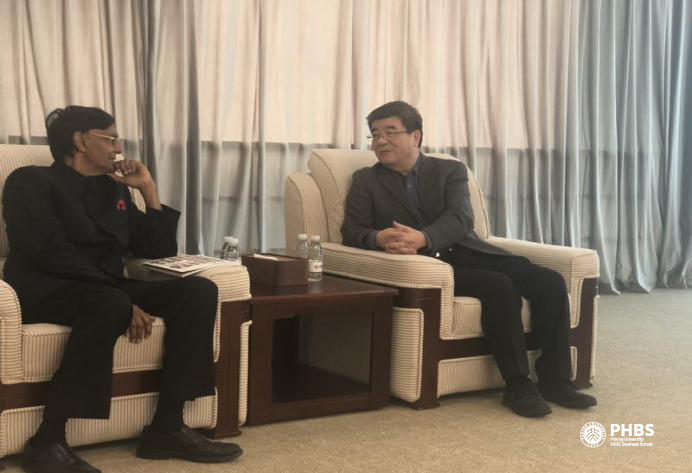 Before the workshop began, Dean Wen Hai held a meeting with professor Munasinghe. 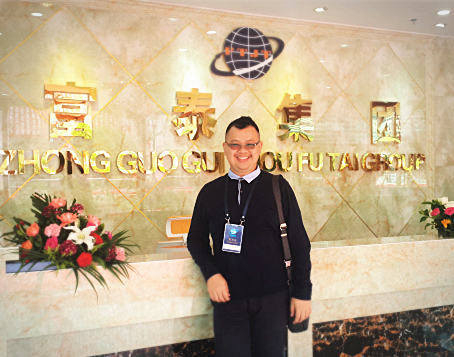 Here they discussed future prospects surrounding the growth of China and sustainable policies that can be initiated. 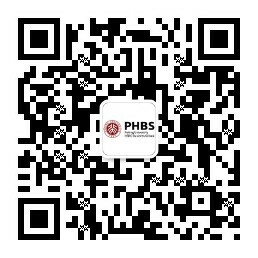 Following this was a deep discussion on the green policies that PHBS is utilizing and future expectations and plans about the topic. 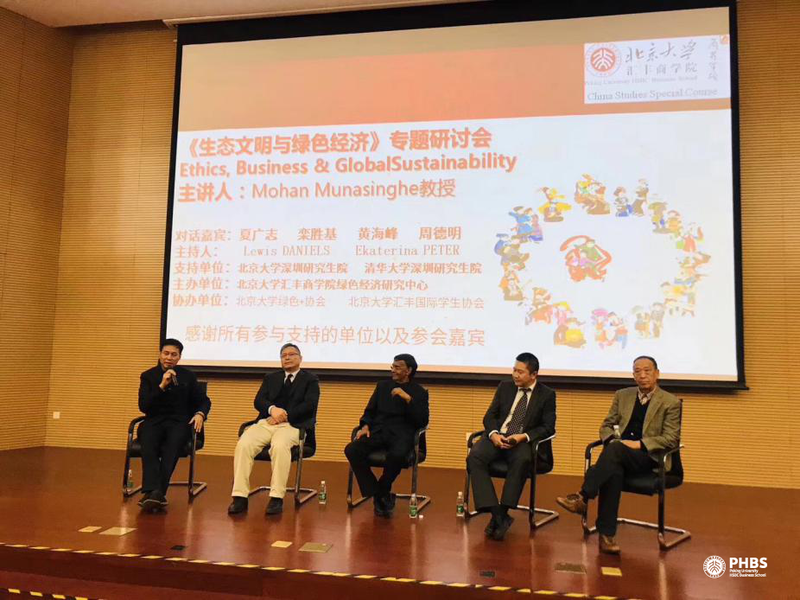 On Thursday 13th December 2018, Professor Mohan Munasinghe travelled to Shenzhen University Town to present his theories on Sustainomics and how China can integrate this within the One Belt One Road Initiative. This was organized originally for the educational purpose of Professor Haifeng Huang’s China Studies class. 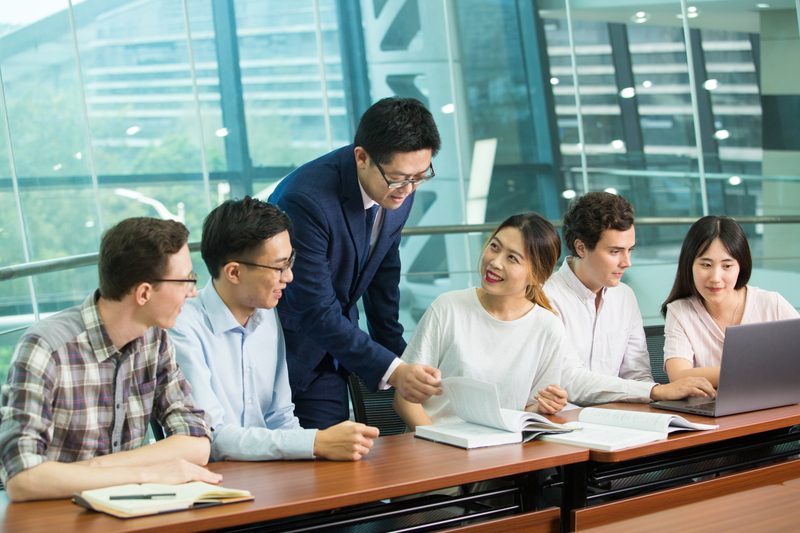 However, after a mass support throughout the University Town campus, it was decided to be the first collaborative event hosted by Tsinghua University and Peking University. 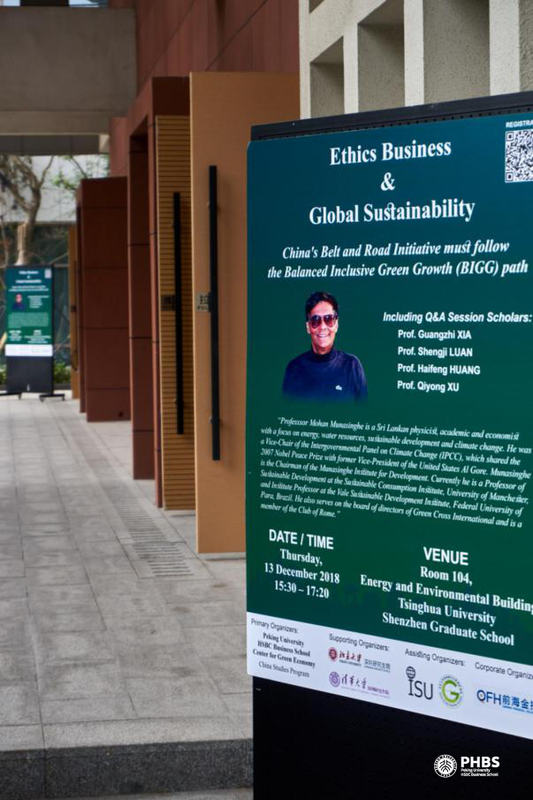 The event started with a warm welcome from Professor Huang who spoke on behalf of PHBS Center for Green Economy and China Studies Program . 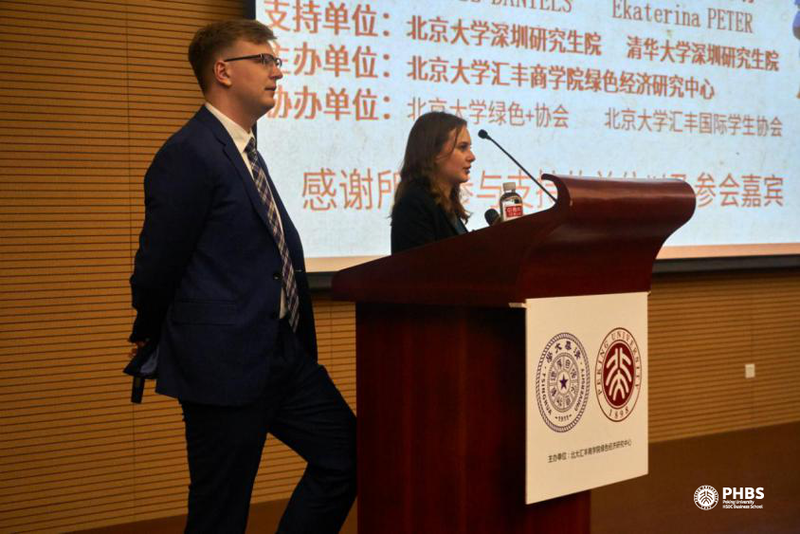 Then Lewis Daniels Gardiner, class monitor from the 2018 China Studies class and Ekaterina Peter, the President of the International Student Union gave a warm introduction and welcomed Vice Dean Xia Guangzhi (Tsinghua University Shenzhen Graduate School) to the stage for further introductions before the workshop got underway. Professor Munasinghe began by enlightening this excited crowd into the history of his achievements. Most notable was the founding of his principal theory of Sustainomics. This is the concept of harmonizing a balanced, integrative Economic, Social and Environmental development throughout the world. This sustainable development triangle is the pinnacle opportunity cost throughout the modern world. This was also presented by the Professor at the Global Climate Leadership Summit earlier this year. 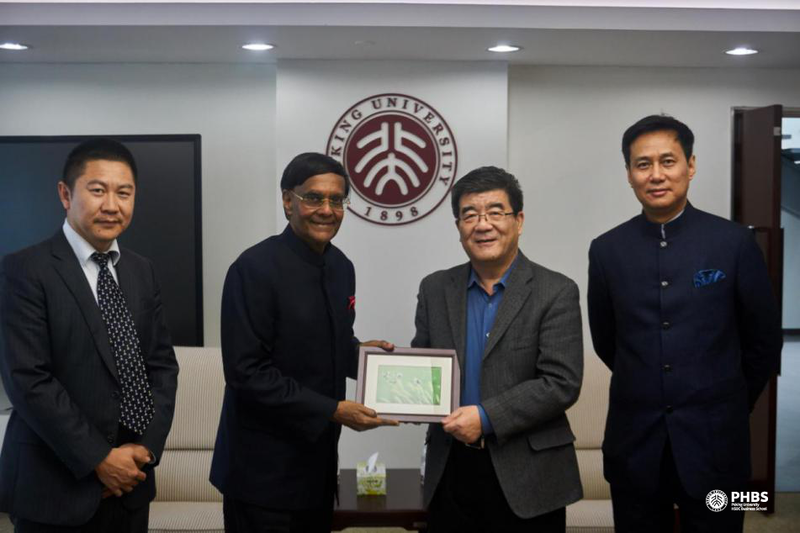 He elaborated on how by striving towards a Green Economy¸ which incorporates the environmental biodiversity of using natural resources to encourage economic growth and stability. 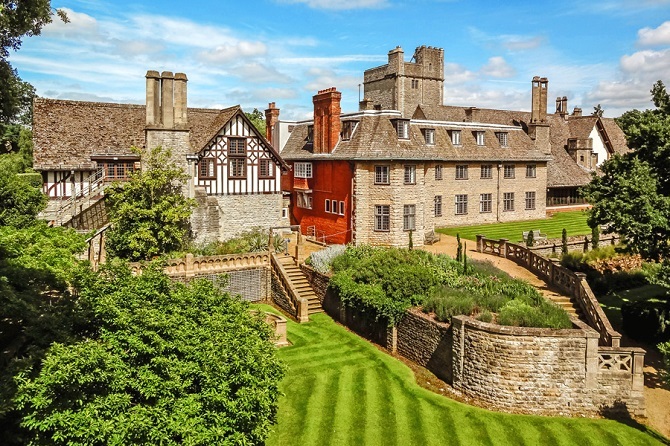 This was expressed in conjunction with the seventeen Sustainable Development Goals that the UN have proposed, which include objectives like no poverty, zero hunger, quality education and gender equality. His principles are being implemented throughout the world and he has become a pioneer of replacing old, outdated unsustainable values with newer ethical practices in all levels of governance. 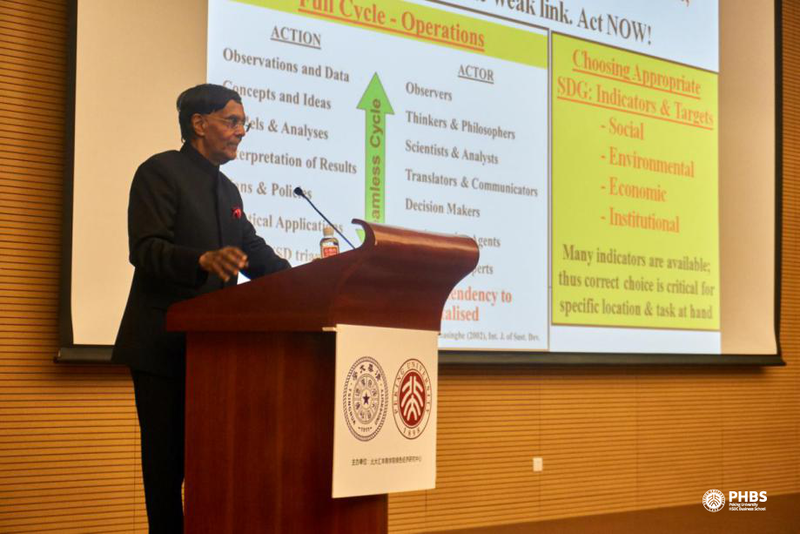 Since being a visiting Professor at Peking University in Beijing, Professor Munasinghe expressed how he had developed a fascination for the growth of China, and with this came his ideology surrounding how the economy can prosper at a sustainable rate for many years if they implement the right policies now. Measures such as carbon reduction and renewable energy being at the forefront of consumer and producer development cycles. Fascinating statistics of the global wealth disparity appeared to shock the audience, such as the richest 20% of the population account for more than 80% of the worlds consumption. This was just one of the many ways that Professor Munasinghe captivated the audience throughout his truly engaging workshop which ended with an enthusiastic applause. 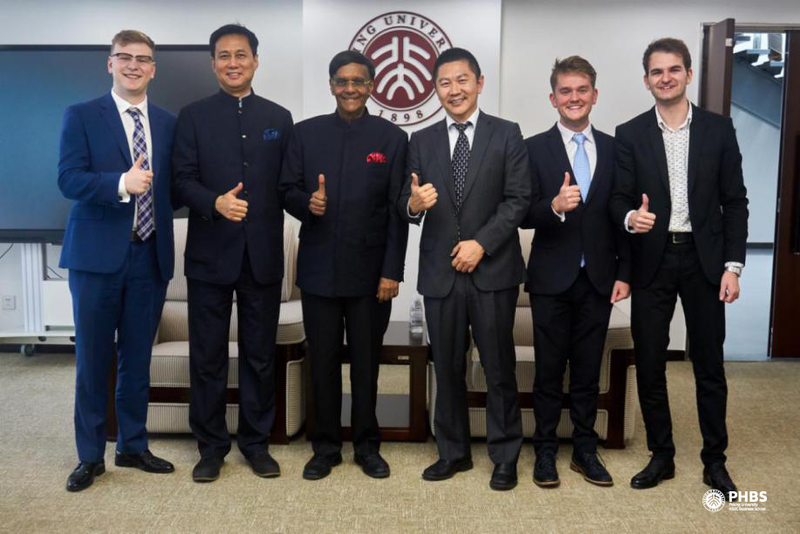 Following his speech was a panel discussion with other distinguished guests which included Professor Luan Shengji, Professor Guangzhi Xia from Tsinghua University, Professor Haifeng Huang and Professor Zhou Deming. The discussion began with an exceptional question from Oren Giladi who is an Exchange Student from Israel, who asked for viewpoints regarding the consideration of overpopulation within China in the near future and whether the 17 Sustainable Development Goals (SDGs) will actually aggravate this process. This spurred a critical debate by all members who had varying viewpoints which was appreciated by the audience at the end the workshop.